I've been a huge fan of Antipodes for several years now and the Antipodes Aura Manuka Honey Mask is one of my most repurchased skincare products, a long-time favourite I simply couldn't be without. 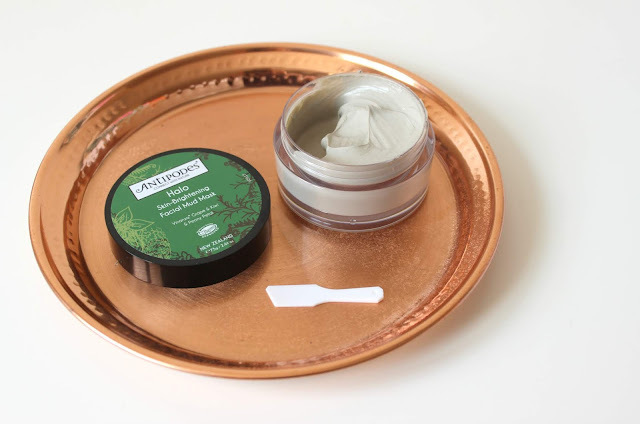 When I found out Antipodes were releasing a new mask, the Halo Skin-Brightening Facial Mud Mask, I couldn't wait to give it a try - with a brand whose products always impress me and leave my skin looking and feeling happier and healthier, I had really high expectations for this newest skincare wonder. It's not the cheapest mask at £49 for a 75g pot but it truly is a lovely mask to have in your routine if it's within your budget. Formulated to give your skin a boost of radiance, Halo works to target skin dullness and uneven tone. It uses a mineral-rich thermal volcanic mud from New Zealand which quickly and effectively draws out dirt and impurities, cleansing skin and giving skin an overall clearer, more luminous look. Other fab ingredients which work their magic include Kiwi combined with Vinanza, which is an antioxidant compound, work together helps minimise the appearance of redness and pigmentation. Scent wise there is the most beautifully subtly sweet scent of vanilla, raspberry and musk, which I am pretty smitten with. Antipodes recommend you use this mask twice weekly, so that's exactly what I've been doing, applying over my face and neck using my favourite method, a handy foundation brush - it gives a nice even and precise application and is pretty mess-free too. I've been using it twice-weekly for around 4 weeks now, leaving it on for 15 minutes before rinsing away with a warm facial cloth. I do find it takes more effort than other masks to completely remove, but no longer than a couple of minutes after which my skin looks clearer, brighter and continued twice-weekly use has also seen the redness on my cheeks reduce slightly. Overall, it's a wonderful new product to join the Antipodes range and also pretty exciting to see Antipodes expanding their range of face masks, too. Will you be giving the new Halo Skin-Brightening Facial Mud Mask a try? I've never heard of this brand before? The colour looks beautiful!